The Avg. Group Saves 21.8%! The Homewood Suites Springfield/North-Holyoke is located in the heart of Western Massachusetts. Designed for both the business and leisure traveler, this hotel is among the newest in this area of New England. Conveniently located on I-91 with easy access to the Mass Turnpike, our hotel offers easy access to many local companies and area attractions. Local businesses in the area include Smith & Wesson, Avery Dennison, Mestek, Marox, Mass Mutual. US Tsubaki, the Holyoke Medical Center and the Soldiers Home, In the downtown, you will not find a boring moment if you take advantage of all the local attractions including the Holyoke Mall at Ingleside (one of the largest and most well known malls in the New England Area), Volleyball Hall of Fame, Basketball Hall of Fame, Six Flags of New England, Yankee Candle Flagship Store and the Holyoke Children's Museum. Holyoke is also close to many area colleges and universities including Holyoke Community College, Mount Holyoke College, Smith College and UMass @ Amherst. The Homewood Suites lavish décor and convenient location offer all the comforts an conveniences of home. This brand new hotel was built with the extended stay traveler in mind. From the open and spacious lobby to all the public area amenities this hotel offers our guest may leisure and business amenities without ever having ever having to leave the property. All of our suites come with High Speed Internet Access and we offer a business center featuring a copier, computer, and fax machine for guest use. This will allow our business travelers to stay connected with work during their stay. Along with these corporate amenities we have a fully-appointed meeting room that will accommodate up to 40 people including a TV with DVD/VCR capability, white board and projection screen. Our leisure guests and those with their eye on fitness are able to take advantage of our state-of-the-art fitness room, indoor heated pool and hot tub as well as our outdoor sports court which includes a basketball and tennis court. Hotel is also newly renovated as of May 2017. Traveling to western Mass and don't want to leave your furry friend behind? Stay with us and you won't have to! Dogs up to 75 pounds are welcome with a $75 non-refundable pet deposit. Bradley International AirportDirections: Going east on Schoephoester Road toward Light Lane. Right on CT-75/Turnpike Rd. for one mile. Merge on I-91 towards Springfield. Take Lower Westfield Rd./Ingleside Exit 15. Left at light - go under the bridge. Take a left at Whithey Ave.
Local Shuttle Info: We do have a shuttle on site based on availability. For your convenience the shuttle will travel within a 3 mile radius. Start your morning off right with a free hot breakfast. Choose from a variety of items including waffles, oatmeal, eggs, bacon, fresh fruit and more. Free coffee and tea are available 24 hours a day.On Monday and Thursday evenings from 5:30 to 7:30, stop by the Lodge for a complimentary evening reception with light fare, beer and wine. "Stay connected throughout the entire hotel with complimentary high speed wireless Internet Access. Premium Wi-Fi is available at an additional cost.Take advantage of the business center, complete with computers, printing and faxing. " 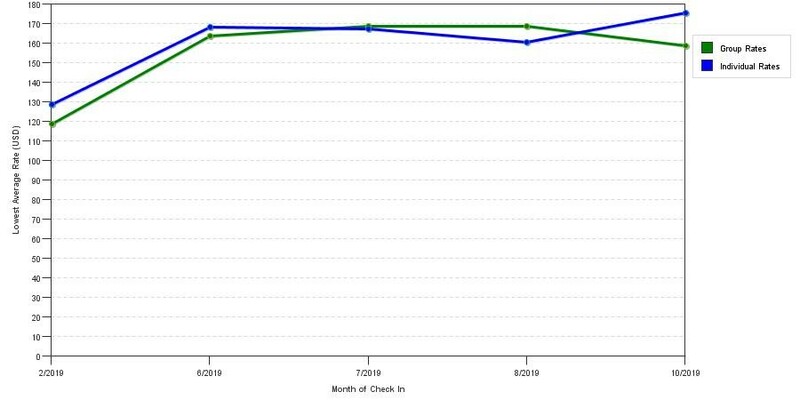 The chart above shows seasonality of prices for both our group rates and the best individual traveler rates our rate checker could find at the time the group offer was placed. The best group rate shown is 37.8% in February 2017 and the highest average individual rate is $213 in the month of July 2018. This chart will show past seasonality and also project future months. If you are flexible with dates, you may want to consider staying at Homewood Suites by Hilton Holyoke Springfield / North in a month when rates are lower. Below are the meeting, banquet, conference and event spaces at Homewood Suites by Hilton Holyoke Springfield / North. Feel free to use the Homewood Suites by Hilton Holyoke Springfield / North meeting space capacities chart below to help in your event planning. Hotel Planner specializes in Holyoke event planning for sleeping rooms and meeting space for corporate events, weddings, parties, conventions, negotiated rates and trade shows. 27 x 24 x 9 Ft.